The Chimera was a fearsome looking beast from Greek Mythology that could breathe fire from its mouth, and was a combination of three animals merged into one. The main body of the Chimera was that of a lioness, taking the strength and speed elements of the lioness. 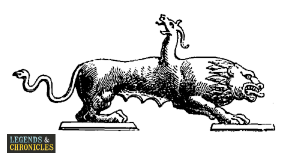 The Chimera also had a goat head on its middle back, and a serpent tail, with the head of a snake on the tip. Not only was the Chimera a scary looking creature, this Greek mythological monster was a dangerous foe in battle. 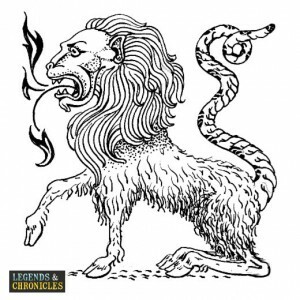 With its ability to breathe fire from the lioness head the Chimera was capable of dangerously hot middle to long distance attacks with its breath. The scorching heat generated by the fire would be hot enough to melt armour and weaponry making the Chimera a hugely dangerous fight to anyone. Up close the powerful limbs of the lioness body meant the Chimera was wholly capable of ripping an enemy to shreds with its claws, and like big cats, the Chimera was an incredibly fast runner, much faster than any human. In order to outrun a chasing Chimera you would need to be on a steed that was capable of running faster than a lion. Finally the serpent tail of the Chimera meant that it would also be able to inject its foes with poisonous venom, rendering them useless before the Chimera would finish its work. These three battle traits of the Chimera meant that any warrior attempting to battle one, would need to have his wits about him at all times, and best to be prepared for a real fight. Told in Greek mythology, the Chimera was said to have been born out of the fires of Mount Chimaear in Lycian in the south of Turkey. On Mount Chimaera the fire pits spew flames and is told to be the birthplace of the deadly Chimera. Greek Mythology tells us that the Chimera was actually female, the mane around her head was not sufficient to cover the ears, showing that the Chimera was female. The Chimera also was known as a Chimaera, and in Greek the name typically means she goat. The Chimera as told in legends, met its fate at the hands of Bellerophon, a Greek hero. Bellerophon was a monster slayer, and was requested by King Iobates of Lycia to dispatch the Chimera. To face such a deadly foe, Bellerophon had to use the might Pegasus, a winged horse, to help him dispatch the Chimera.